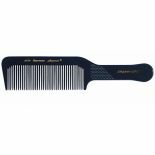 The HS4770M Clipper Comb is for the barber when creating a classic masterpiece cut! The HS4770M Clipper Comb is 9.5" long and has a geometric design for fast and perfect flat-top clipping. This handy design has fine teeth for perfect transitions between scissors and clippers. • Made by hand from 100% Vulcanized Natural Rubber - twist-resistant and yet flexible. • Antistatic material - chemical and heat resistant. • Non-porous (will not support the growth of mold or mildew) guaranteeing hygiene. • The teeth are hand-sawn, hand-cut, and hand-polished to perfection! • Very smooth and gentle to the hair and scalp due to rounded tips and sides.